My second favorite thing is posting and archiving my all time favorite recipes. Most evenings, after the house is buttoned down for the night, you can find me curled up perusing the stacks and stacks of cookbooks and magazines which have a tendency accumulate at my house. (Mr. “One-Click” at Amazon beckons me frequently.) I am always trying new recipes, but it is pretty rare for me to like something so much I want to make it a second time. Or tell my friends about it. I am pretty picky. Over the years, after trying thousands of different things, I have built a répertoire of “go-to” recipes I make over and over again. These are my “A” player recipes, the ones I count on and always get gobbled up with rave reviews. 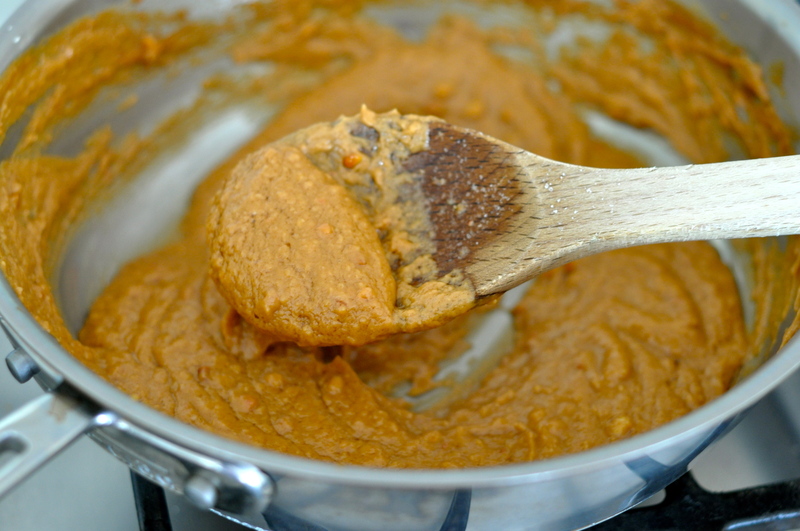 Spicy Thai garlic ginger peanut sauce is way at the top of the list. It’s a recipe circa 2001 from Cooking Light. I make this all the time. It is quick, simple and versatile. It goes great with grilled chicken or beef satay skewers. 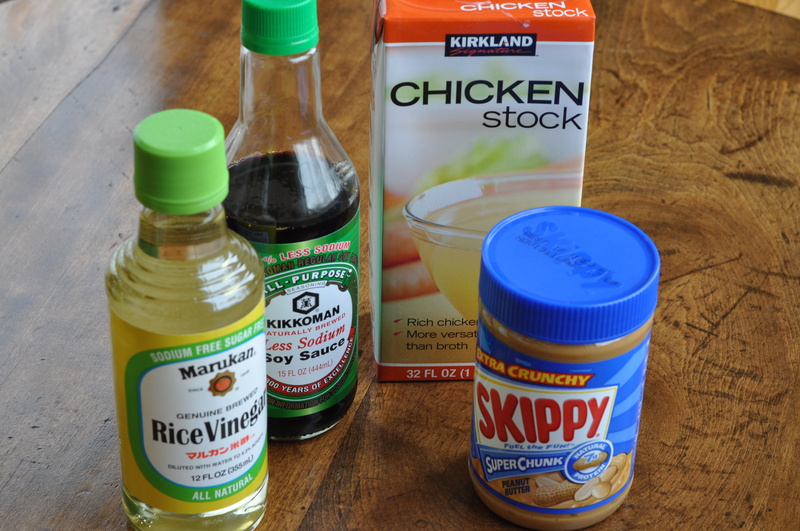 I also use the sauce to make hot Peanutty Noodles – click for the link. I don’t have a deep bench when it comes to Asian/Oriental ingredients in my pantry. I love, love, love Asian flavors and food, but I tend to go out to restaurants to get my fix rather than cook it at home. I like this recipe because there is not a long list of asian ingredients or tools you have to go out and buy first before making it. The recipe does calls for a couple of ingredients you might have to hit the store for: fresh ginger (don’t worry I will show you how) and chili garlic sauce. Other than that, you should have everything else at home. 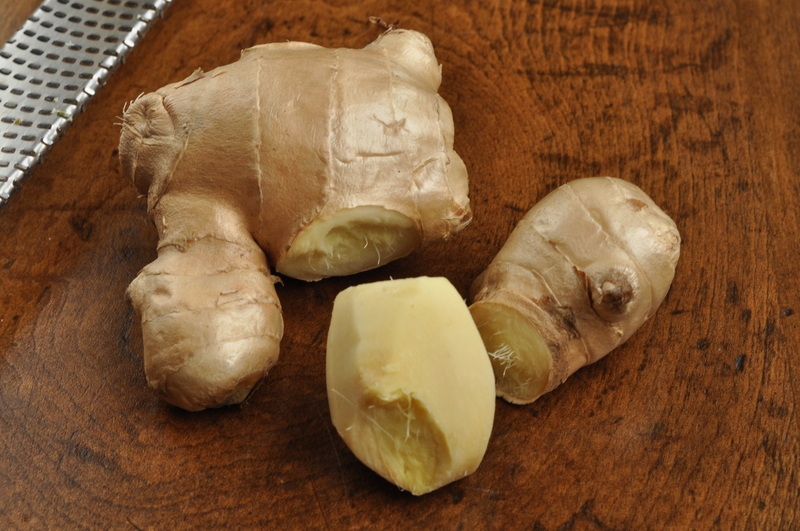 This is a knob fresh ginger – find it in the produce section next to the bean sprouts and snap peas. Break off one of the arms and peel it with a vegetable peeler. 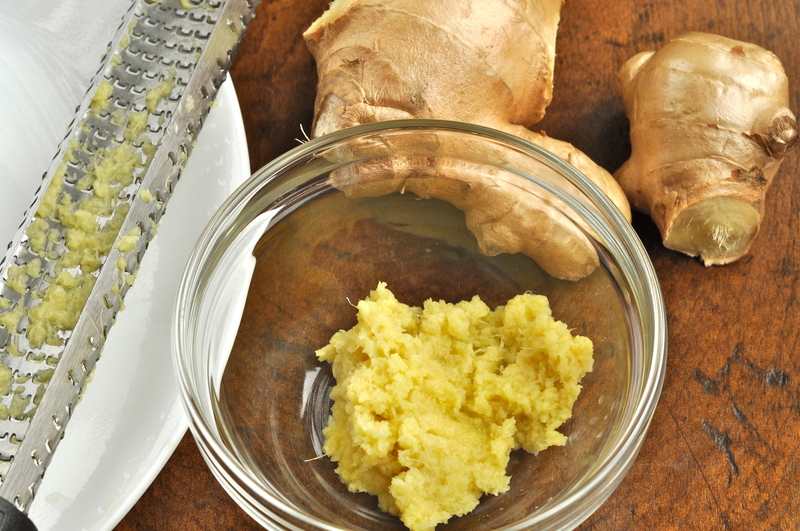 Grate the peeled piece of ginger until you accumulate 2 tsp. Inhale deeply and let the wonderful aroma transport you away. 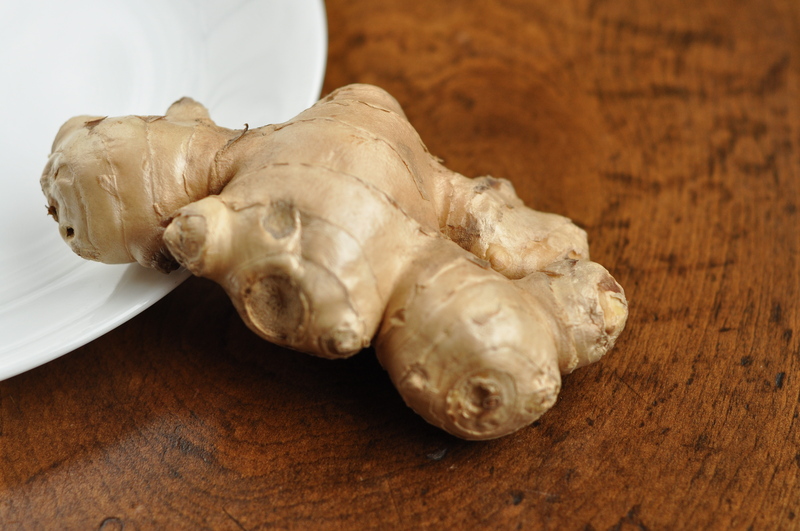 The unused ginger can be stored in a baggie and refrigerated. 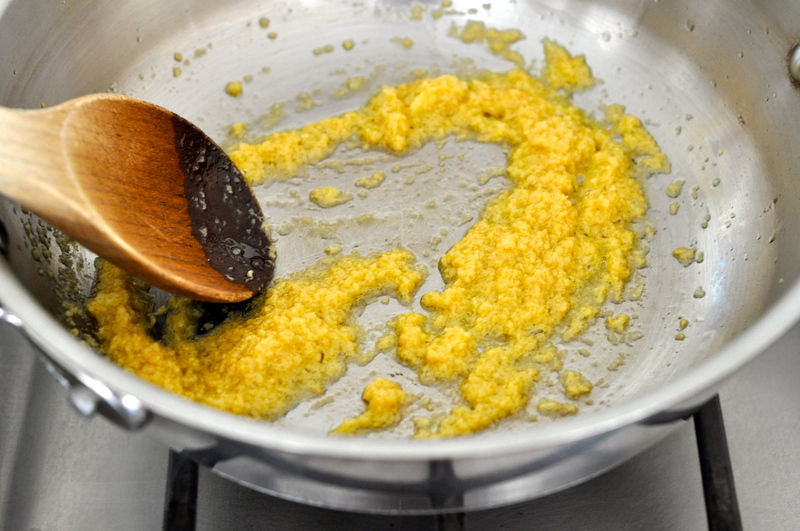 Saute the fresh ginger and garlic in the olive oil for a quick 30 seconds. Add the chili garlic sauce. 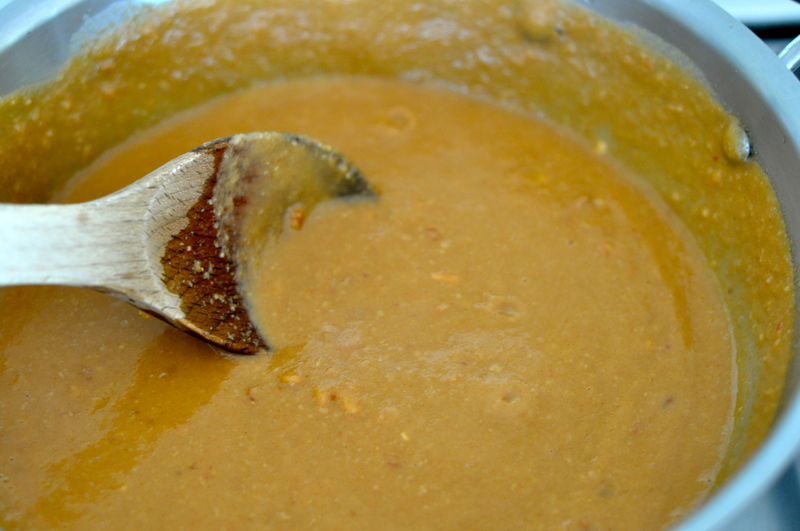 Here is a picture of the chili garlic sauce. I get the brand with the rooster on the label. Another brand easy to find is Lee Kum Kee. 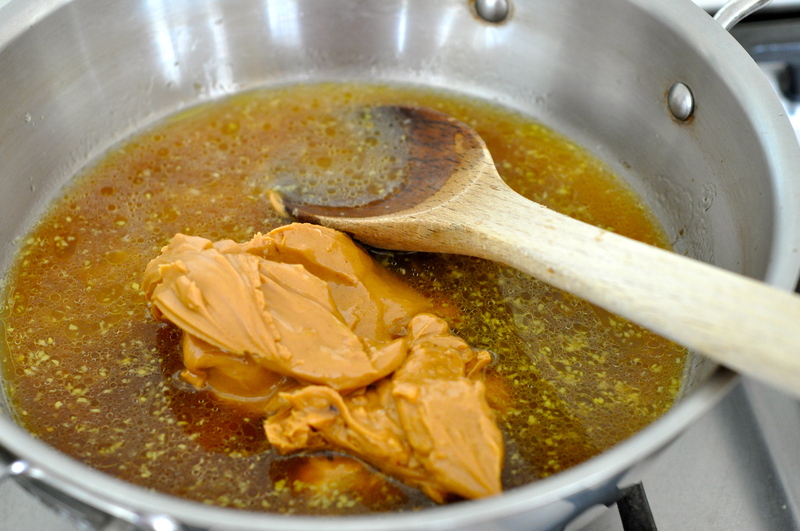 Add the chicken broth, peanut butter, soy sauce and rice vinegar. Stir until well blended. Reduce heat and gently simmer for 5-7 minutes, stirring occasionally. It will get thick like this when it is done. 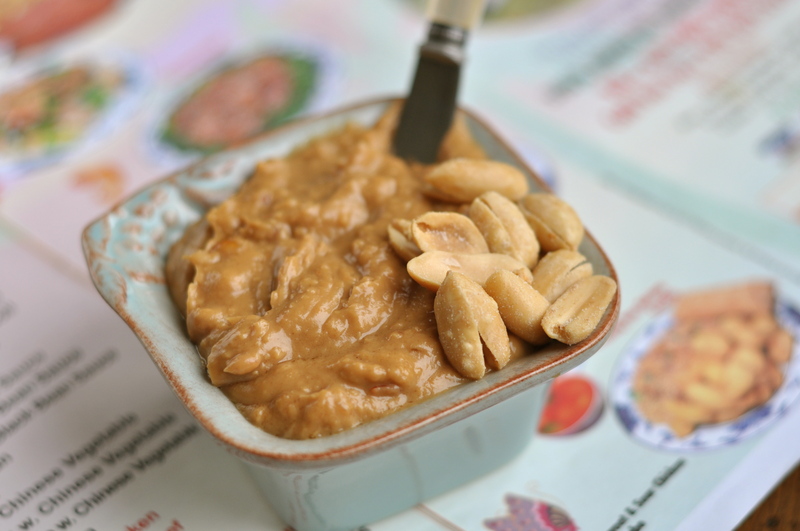 Toss it with hot noodles to make Peanutty Noodles. 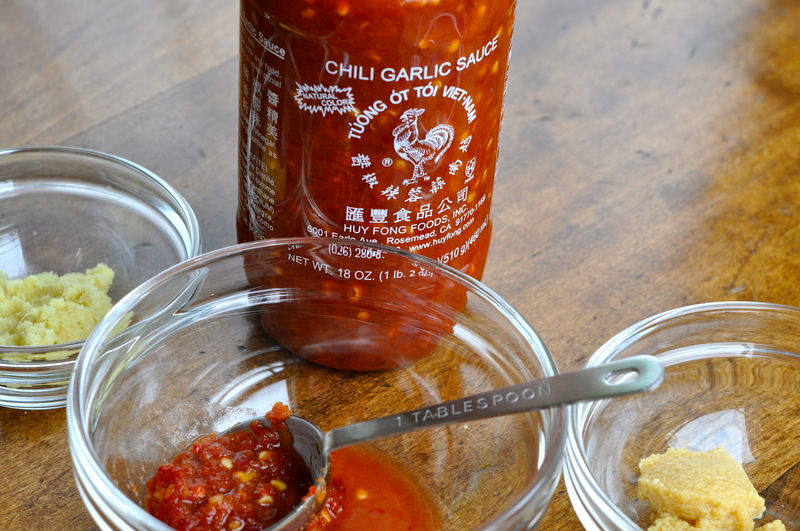 Grill chicken or beef skewers and serve with this dipping sauce for satays. It’s great to make it ahead and refrigerate. (Let it come to room temperature before you use.) Let me know if you have more ideas on how to use it! Oh gosh, this sounds wonderful! I have never had chicken satay but have been wanting to try it forever. When the weather gets nice enough to grill, I’m going to finally try it with this sauce! That ingredient list sounds perfect.